Perhaps you keep wishing your life were better than what you are currently experiencing now. What if more of God is actually what’s missing from your life? Do you encounter the freedom God brings each day? Whether it's a messy life or a messy problem in your life, it can become a walking miracle when we see God anew and wholly surrender to Him. Right away when I started reading I was hooked. My life also has been messes to miracles. I could relate to her story. I was not in her profession but I have made many wrong choices in my life. Choices I am not that proud of - but I have learned to believe they made me who I am today. A few pages into More she explains how she begged God for help and he answered her. This brought tears to my eyes as I re-lived the terrible incident when my husband was seriously burned. A time when I was totally lost - I begged God to lead me and my husband - I completely turned it over to him. I was unable to deal with helping my husband heal and also focus on who caused the terrible accident. Once I gave the entire situation to GOD - I was able to cope. Some say there are no MIRACLES. But I am a firm believer that GOD gave us a miracle that day. Prior to handing the situation to God my husbands burns were so bad that there was fear he would lose his fingers. After asking for God's help - the local physician on call knew a plastic surgeon that was in town. The surgeon just happened to be one of the best in the USA. Who would of thought small town USA had one of the best burn specialist available to care for my husband. My husband had a long healing process but we are happy to say he healed and has total use of his arm and hand. When Tammie used the reference of God as medicine for us - I totally agreed. Yes we need doses of God to keep going. Just like thyroid medicine - I laughed when I read about her thyroid. I too have hypothyroidism. How ironic that is! 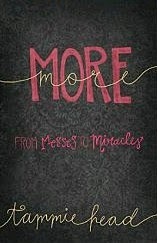 I am reviewing her book - I was and at times still think I am a mess - I've seen God's miracles and yes I need reminding. Wonder if there was a reason I was asked to review MORE??? I do believe there was!!! It sounds like a great read. I think many of us were in the boat she was in. I need to stop and read this. I feel like this post and book are speaking to me! Sounds like a book I'd enjoy reading. I agree that God is medicine for us all!